A earlier introduction to Kyra, being forced into one of the empty hellhound cages on cremetoris. The sub-plot of the Furyan energy is completely restored, several instances of these scenes are visible in the trailer for the film but not contained in the theatrical version of the film. Riddick, while in cryo-sleep aboard Toombs' Skif en-route to Helion Prime is approached in a vision by Shirah (Played by Kristin Lehman as in the game "Chronicles Of Riddick: Escape From Butcher Bay"), and she starts to tell him about Furya before he is interrupted by his arrival at Helion Prime. The Purifier's speech to the captured people of Helion Prime is longer (Director David Twohy on the commentary comments that this is the complete version as originally intended). Vaako and Dame Vaako's discussion about the Lord Marshall being promoted to full death is extended, continuing with him and her discussing his demise and foreplay. After Dame Vaako queries Aereon about Riddick, she discusses what she learns with Vaako over a telepathy/communication with him on the transport. 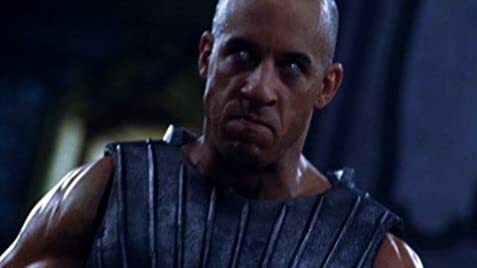 The fight sequences between Riddick and the Necromonger armies on the surface of Crematoria is completely unedited, containing full sound effects of the fight and is more visually brutal. After the fight on the surface of Crematoria, Riddick is surrounded by Necromongers and Vaako is about to shoot him when Shirah re-appears to him and reveals the truth about what happened on Furya, the revelation sending out a blast from Riddick, knocking all the soldiers down and leaving Riddick unconscious - A shot of this "blast" can be seen in the trailer. The ending is more abrupt, Riddick says "you keep what you kill" instead of Vaako, and Aereon's voice-over is not included. 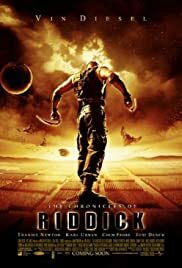 Q: How many versions of "The Chronicles of Riddick" are there? Q: Is 'The Chronicles of Riddick' based on a book? Just had fun watching TCOR and am pretty happy about it. Good action, great visual stuff. A worthy successor to Pitch Black, though the two films are hardly related. Vin Diesel does a good and convincing job at playing an action antihero. As usual, Judy Dench adds to the film, even though her role is small here. The story is pure pulp SF and is short and predictable but is refreshingly dark and (mostly) unsentimental. It actually also has some interesting bits and nice side stories as a (smallish) bonus. Bits and pieces have been copied from Dune, without the film being a Dune copy. Compared to Dune, TCOR has more action and fewer Lynch oddities & boring bits. In my book, both films are good, about equally so. Reading some of the other reviews, it seems that people are fairly polarized in their opinions of this film. Like most pulp science fiction, it takes a different sort of suspension of belief from that which makes usual films work. However, the action makes it a fair bit easier, and I found it a lot more engrossing and convincing than any of the five (ridiculous but entertaining) Star Wars films, the uniformly unwatchable Star Trek stuff, or, for that matter, most blockbusting light entertainments. But that is just me. If you hate Dune, exaggerated action scenes, or (minor) plot inconsistencies, then you probably won't like this film. Otherwise, chances are good that you will. 131 of 161 people found this review helpful. Was this review helpful to you?